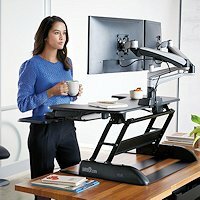 Can Headaches And Neck Pain Be Caused By Sitting At A Computer? Do you sit at a computer for extended periods? Do you get migraine headaches, tension headaches or neck pain? Can computers be the cause of your headaches? Computer headaches are common. Let’s see why and how to help. Has it ever occurred to you that while you are happily typing away on your computer or phone for hours on end you are actually creating a problem in your neck that can lead to persistent neck pain and headaches? When a person with headaches and neck pain visits a chiropractor, the usual treatment for most patients is to manipulate, or adjust, the neck. Chiropractors teach us that many headaches come from neck problems and that by adjusting or manipulating the neck headaches and neck pain may be relieved. According to studies more than 70% of headache patients that receive chiropractic treatment show improvement that ranges from slight improvement up to complete elimination of their pain. This one fact makes it seem logical that the majority of migraine or tension headaches originate from problems in the neck. It also seems logical that if we knew what was causing these neck problems, and eliminated what was causing them, we could also eliminate the headaches too. After examining thousands of patients we discover that as many as 95% of neck pain and headache patients had one thing in common, a straight or reversed neck curve. From the side view a normal neck should have a slight curve in it. But as many as 95% of headache and neck pain patients had either a lessening of that curve, no curve at all, or a curve that was completely reversed. When these altered cervical spine curves were treated with chiropractic adjustments, most showed great improvement. 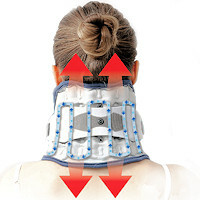 Chiropractors know that this type of pain can be caused by poor neck posture, so the next question becomes, Can sitting at a computer cause poor neck posture? If the answer is yes, then it’s obvious that sitting at a computer can, and in fact does, cause head pain. People usually develop poor neck curvatures because of poor posture habits. Anything a person does that places their head in a position forward to their body will lessen or reverse their normal neck curve. And poor neck curvatures DO cause head aches. Chiropractors have been teaching this for decades. The types of activities that can lead to poor neck posture include sitting at a computer for extended periods of time, reading with the head bent forward, sitting while slouching in a chair or on a couch, sleeping with the head or neck in odd positions, or any other activity that places the head in a position forward to the body. So, to answer our original question, yes, headaches and neck pain can be caused by using computers. Good posture from the beginning can surely prevent the development of bad neck posture, which would seem to be the best remedy, but what can be done if the lessening or reversal of the neck curve has already been developed? Obviously, chiropractic treatment is an option that could be considered. But there are many other alternative treatments and ergonomic solutions. Most people naturally try the easiest approach, which is to take a pain pill. But are pain pills always the best approach? They may be in some cases, but there are many other treatment options that don’t require the use of potentially harmful drugs. All drugs have side effects, some of which can end up being worse than the pain itself. There are many natural remedies. These include stress and tension reduction, ice therapy (used at the base of the skull), eliminating food triggers, getting the proper amount of rest, biofeedback, neck pillows or cushions, exercises and many others. We have traction devices from sophisticated equipment to simple pillows that are designed for the purpose of restoring the normal neck curve. Chiropractors know that by eliminating poor neck posture, headaches can also be eliminated. For many years these devices have been recommended by chiropractors to their patients to help restore the proper curve and obtain relief from postural stress. Maybe it’s time you tried the natural, no-drug, approach to better health. Additionally, an ergonomic seating device can be used with a regular chair to give support to the lower back, upper back and neck and help maintain better posture, while reducing muscle fatigue that is often found with computer headaches. Take breaks every 15-20 minutes. This should involve getting up, and walking about the room. This will provide a break from using your eyes, promote circulation, and allow the spinal tissues to be exercised to avoid postural strain. Maintain upright posture at all times. Avoid slumping, or sitting with your feet up. Look straight ahead at your monitor screen. The ideal position is the middle of the screen slightly above eye level. This is different than many ergonomic specialists agree in that this position is somewhat higher. 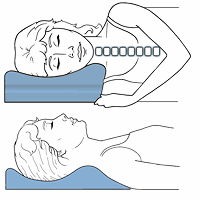 However, this head and neck position is the most favorable for your overall health. So, raise up the monitor height, so that the middle of the monitor is above eye level. This facilitates an improved neck and head position, and therefore reduces abnormal stress and strain upon the neck and shoulder muscles. Place your feet firmly on the floor in front of you. If you require one, use a foot stool. That is, if your chair and desk configuration does not allow you to have your thighs at a ninety degree or greater angle to the floor, then you may need a foot stool or support. Additionally, to help avoid computer headaches, use a trackball or trackpad instead of a mouse. A wireless mouse can also be valuable if compatible with your system. Modify the settings of the input device to allow maximum travel with minimum movement of your hand and or arm. Over time, this can be most beneficial to your overall physical stress level. Use a headset if you are ever on the phone while using the computer. In fact, you should use a headset whenever possible. This will most assuredly reduce strain on your neck and shoulder muscles. If you have bifocals, and you seldom look away from your screen to focus on other things, you should consider a pair of glasses dedicated to computer use only. In many patients, the repetitive nodding required of bifocal is very challenging to the muscles of the upper neck and can aggravate computer headaches.